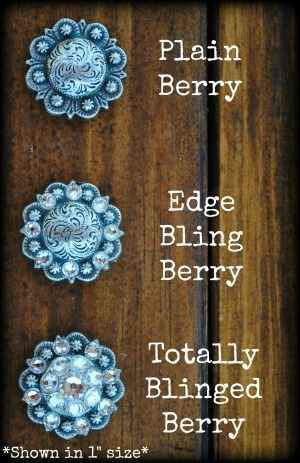 Bronc halters come standard with plain bery conchos. 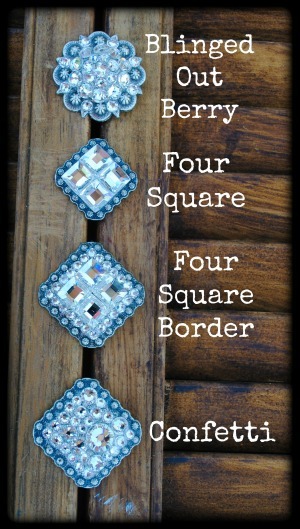 You can choose to upgrade to edge bling (1 rhinestone color), totally blinged out (up to 3 colors), four square (crystal or AB), four square with border (crystal or AB squares with additional border color), or confetti (crystal or AB) conchos. These options are listed on indivudal halter pages. 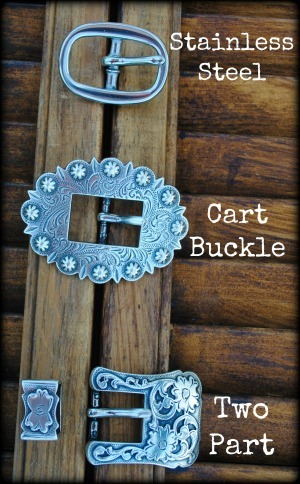 Tack sets are priced with the concho style shown. We can use any concho style on any of our sets, but it may affect the price of the set shown. Headstalls come with cart buckles and are priced accordingly. All of our breastcollars come standard with stainless steel buckles on the tugs. 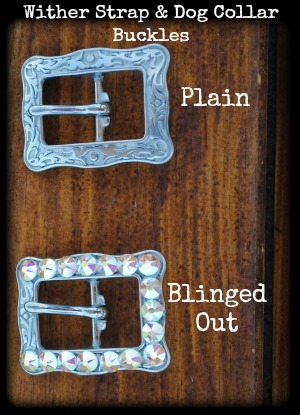 We can upgrade to plain cart buckles, edge bling cart buckles, or totally blinged out cart buckles. These options are listed on individual set pages. Wither straps and dog collars come with the buckles shown above. Wither straps are priced with plain buckles. You can select to add bling on the individual product page. Some of our dog collars are priced plain and some include blinged out buckles. We can use either style on any dog collar, please send us an email if you would like to make changes.